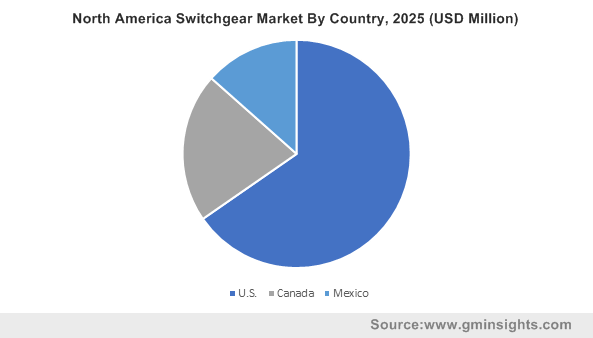 North America Switchgear Market size in 2018 surpassed an annual installation of 7 million units and is anticipated to exceed USD 25 billion by 2025. Rising expenditure toward infrastructural establishment coupled with regulatory reforms for the expansion of electrical infrastructure across grid isolated areas will positively sway the North American market size. Furthermore, significant growth in power demand along with rising regulatory intervention toward the integration of energy efficient grid infrastructure will boost the industry landscape. LV Switchgear market is expected to expand over USD 13 billion by 2025. Wide range applications across small scale process industries, manufacturing and economic zones favored by large scale residential deployment will complement the business outlook. In addition, supportive power distribution measures along with rising demand for smart control & monitoring units will further boost the industry scenario. High & Medium Voltage switchgear market is anticipated to observe substantial upsurge owing to ongoing industrial and commercial developments across the industrial peripheral. Ongoing expansion & refurbishment of transmission & distribution networks in line with favorable strategic implications by leading industry participants will further stimulate the business landscape. Switchgear market size from air insulation will expand owing to effective operational safety and low capital investment. Growing fund flow toward product & technological performance improvements will further enhance the product penetration. In 2018, gas insulated products held over 13% of the North American industry share. Low space requirement, minimal maintenance, improved reliability and high dielectric strength are the prime factors favoring the product deployment over other current alternatives. 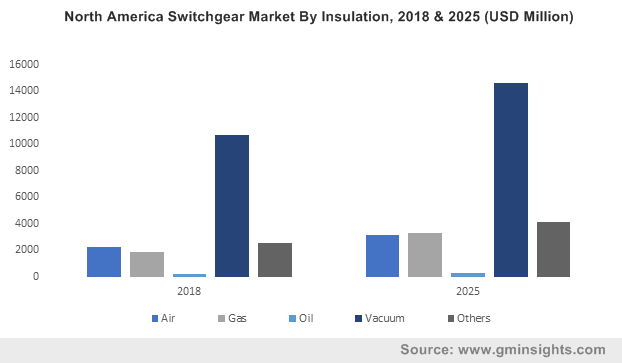 Vacuum insulation-based switchgear market will witness upsurge owing to its high impulse voltage withstanding ability and flexible power frequency integration. Pollution and noise free operation, ease of timing and actuation along with large scale expansion of high voltage grid networks will propel the product demand. 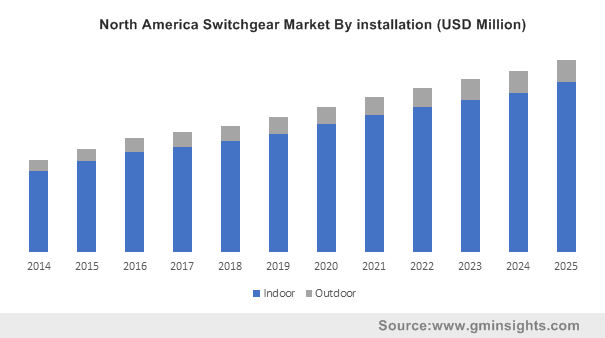 Indoor switchgear market is expected to expand over 5% by 2025. Burgeoning real estate sector on account of increasing private & public fund flow will stimulate the business outlook. Rising space constraints coupled with shifting focus toward energy effective power distribution networks will further complement the industry dynamics. Direct Current switchgear market is expected to grow on account of growing demand for High Voltage Direct Current (HVDC) grid systems in line with comparatively quick lead time requirement. Allocation of an efficient interconnection support for AC circuits adhered by functional versatility will further complement the industry landscape. Residential and commercial applications in 2018 accounted for over 20% of the North American switchgear market share. Regulatory supported sustainable residential infrastructure developments in line with ongoing urbanization will boost the industry scenario. Smart control networking initiatives supported by distributed generation technological integration will further augment the product adoption. Shifting focus toward energy efficiency and growing concern toward assimilation of various frequency electricity transmission links will propel the industrial switchgear market. Rising community-based electrification programs coupled with increasing private fund flow from institutions including International Finance Corporation, World Bank and Asian Development Bank will positively sway the utility switchgear industry. 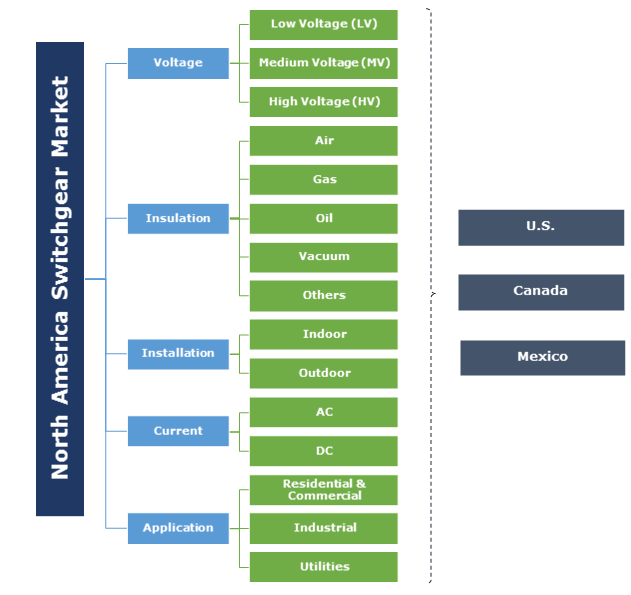 In 2018, the U.S. switchgear market was valued over USD 12 Billion. Regulatory reforms toward the refurbishment and revamping of the existing power infrastructure supported by increasing demand for energy & cost-efficient systems will enhance the business portfolio. In addition, growing energy demand along with rising fund flow toward the installation of sustainable networks will positively sway the industry dynamics. Prominent players in the switchgear market across North America are Schneider Electric, ABB, Siemens AG, Toshiba, GE, Mitsubishi Electric Systems, Larson & Turbo, Ormazabal, Crompton Greaves, Eaton, Hitachi Ltd., Powell Industries, Hubbell, Iljin Electric, BHEL, Rittal, Hyosung, Meidensha Corporation, Lucy Electric, and Fuji Electric. Shifting inclination toward packaged switchgear technology coupled with custom-made product features for adaptable applications have incorporated a competitive industrial scenario. Effective engineering and technological support along with quicker lead time will further stimulate the business outlook. Switchgear carries, breaks and makes the normal power load and rectify the electrical fault along with regulating and metering of various factors across the electricity system. These products are deployed by residential, utilities and industrial customers across low, medium and high voltage applications.